MJ stop working on my TC, after a call! Help please! Can I Use Virtual Memory on a TC? MagicJack Thin Client for My Dad! What can I do with mjproxy? MJMD5 and a Thin Client - Advantage over using the dongle? Help??? More Video Memory on the TC???? 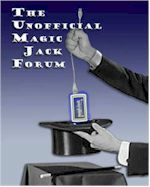 Does Magic Jack need Java to run?? Looking for a thin client do you have one for sale? How to remote shutdown thin client through teamviewer? XPe flash file for 256m Neoware e100????? Upgrade to XPe SP2 Necessary?